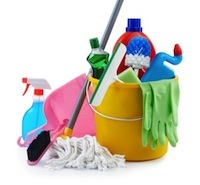 With children in the household, many parents think the home can never be too clean. Clean doesn’t always mean simply tidy and free of clutter, gunk, and debris; it often means disinfecting to kill germs on every surface. Many parents turn to chlorine bleach for the cleanest clean but a new study indicates children are healthier when the use of household bleach is limited. It’s true bleach kills germs. Bleach is a caustic chemical, meaning it causes lethal chemical burns to organic tissue such as mold, mildew, and bacteria. A new study from Europe indicates merely breathing in the caustic fumes of bleach can damage the respiratory tissue of small children enough to make them more prone to a number of ailments. The study, led by Dr. Lidia Casas, of the Department of Public Health and Primary Care at the Centre for Environment and Health in Leuven, Belgium, compared the health of children in Finland, the Netherlands, and Spain with the use of bleach for cleaning their homes and schools. The parents of the children were asked to complete questionnaires that detailed how often their children developed certain infections in the previous 12 months and if bleach was used to clean the home. The infections in question were bronchitis, influenza, otitis, pneumonia, sinusitis, and tonsillitis. The questionnaire asked how often a child experienced each infection: never, once, twice, or more than three times in the previous year. 7% in Finland were cleaned with bleach about once a week. 72% in Spain were cleaned that frequently with bleach. 18% higher risk for any infection during the previous year. 20% higher risk for one episode of the flu. 35% higher risk for recurrent tonsillitis. The authors of the study consider their findings to be significant enough to regard passive exposure to bleach in the home as a public health concern. They acknowledge, however, their study is limited. No measure was made of how much bleach was used, except for its use once a week, how close in proximity or how long a child was exposed to bleach fumes, or what other cleaning solutions might have been used in conjunction with bleach. This study strengthens previous research which implicates bleach as the culprit for increasing a baby’s risk of wheezing and respiratory infections during its first year and increased risk of airway inflammation in children of school age. For a home that’s both clean and healthy for the littlest family members, the national Eco-Healthy Child Care program offers inexpensive non-toxic alternatives to bleach and other common household chemicals. Casas, Lidia, et al. "Domestic use of bleach and infections in children: a multicentre cross-sectional study." Occupational & Environmental Medicine (2015). BMJ Publishing Group Ltd. Web. 4 May 2015. "Household Chemicals." Eco-Healthy Child Care. Oregon Environmental Council, n.d. Web. 4 May 2015.